And now, another episode of “Waltz time”, the popular program of light music created by Frank and Anne Hummert. The first song is “This Heart of Mine”. Abe Lyman and His Orchestra, vocalist Frank Munn, the Amsterdam Chorus. The announcer is Andre Baruch. The show was originally heard on NBC on April 20, 1945 and was distributed as program 81 in the series for the Armed Forces Radio Service. 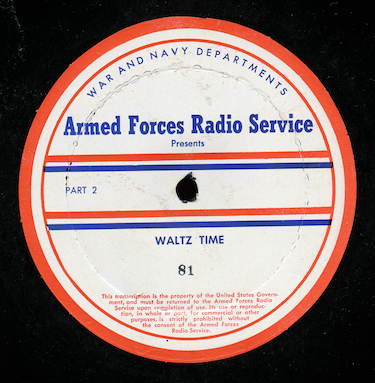 Our mp3 was transferred from an original Armed Forces Radio vinyl transcription. The date is from the matrix. It appears to be a previously uncirculated episode.